The CSUS Fine Arts mission is to educate students in the fundamental techniques of visual and performing arts. We provide a safe environment where students can express themselves. 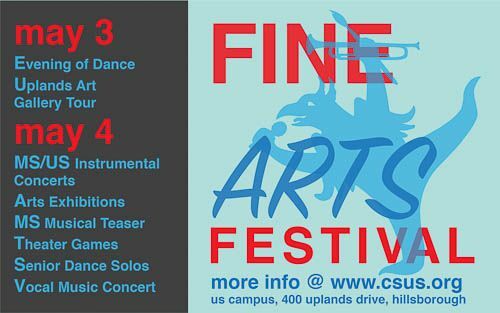 The CSUS Fine Arts believe in the importance of providing students with a progressive, experiential, visual and performing arts curriculum that offers exploration as well as depth and breadth. We believe the arts are for everyone from the novice to the experienced, and we will provide a creative outlet for every student. We strive to cultivate self-expression, an understanding of the language of the arts, appreciation of the intrinsic value of the arts, and a working knowledge that a multitude of solutions exist to solve artistic challenges. We believe that the arts are part of the human experience and are an essential part of a quality education. SFMOMA is often considered one of the best modern art museums in the country, rivaled only by its counterpart in New York. 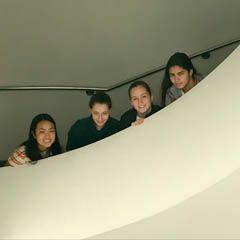 Crystal fine arts students take an annual fall pilgrimage to the museum to explore exhibits and gain inspiration for their own work. 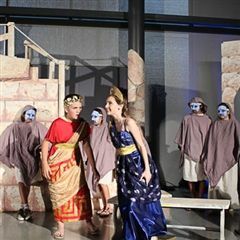 We ventured to ancient Greece for the Middle School fall play, Theseus and the Minotaur. This humorous take on mythological events featured gods, muses, royals, monsters, villains, heroes (including THREE actors playing Theseus) and, of course a fabulous Greek chorus. 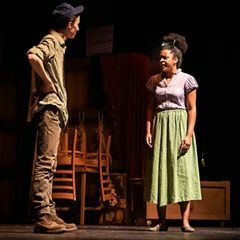 "Incredibly moving," was an apt and shared description of the the Upper School's production of Thornton Wilder's Our Town. The cast and Cru [sic] made the most of this American classic with stellar performances and a deceptively minimalist "back stage" set with many moving parts. Please join us for this two-day festival that showcases the accomplishments of our talented artists.